Here's the markings I'm going for. 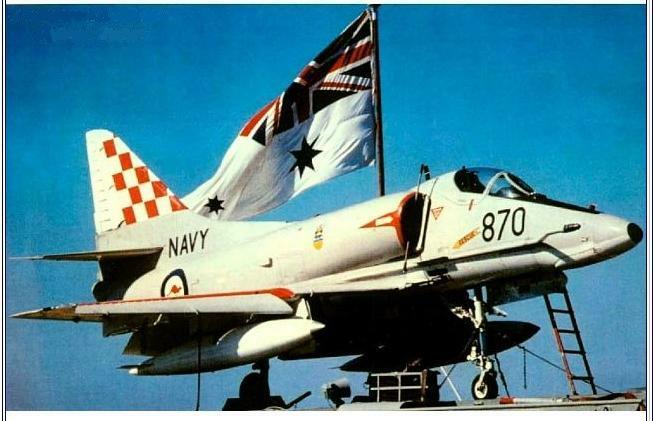 Flew off the HMAS Melbourne. Think it's 805 Sq., but I need to re-check that. I'm looking forward to watching this one, Russ! One question: Are you going to re-scribe it? Okay,....so it begins. Haven't even started on it one day, and it's already morphing. Gadzooks! Spent most of the night doing basic research on the pit, and trying to choose my 'pilot personality'. More on that later. 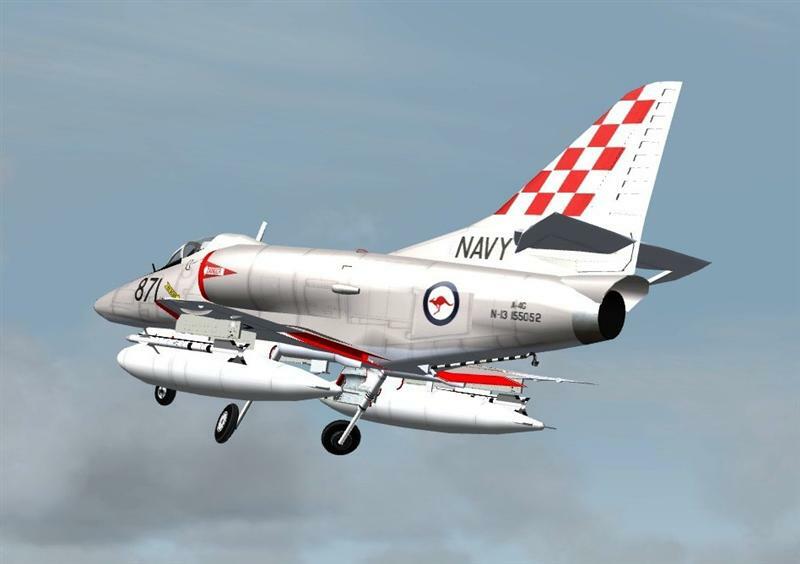 I already had to revamp my squadron markings cause I got the insignia the wrong size/place, and the wrong number of 'checkerboards on the tail on my digital paint-job above. Aaaach! 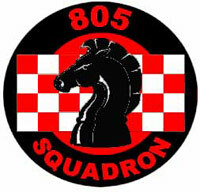 Here's a pic of the real deal, and the squadron emblem of VF-805. 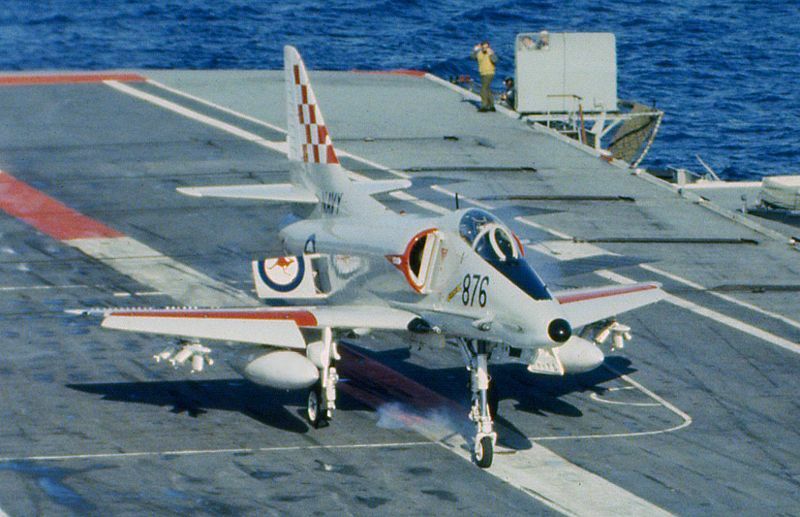 Call sign for this squadron was strangely enough...."Checkmates"! Wonder why? Bwhahah. I love this pic. Every pic I've seen of these AC are in immaculate condition and very shiney. Here is a close-up of the squadron patch that will go behind the engine intakes on the fuse. (whups, forgot to put it on before I took this screenshot,drat!...but it's on the orignal above) Also a pic of my revamped markings painted digitally. 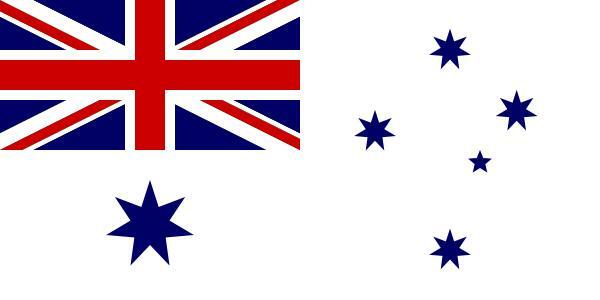 Correct number of checkerboards now, and the national insignia in the right sizes/places. 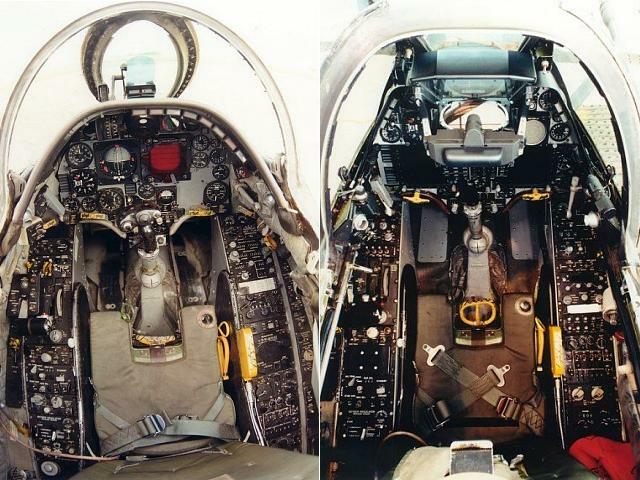 Couldn't find a pic of an A-4G cockpit, but here's a shot of a Kiwi pit before and after the Kahu conversion. 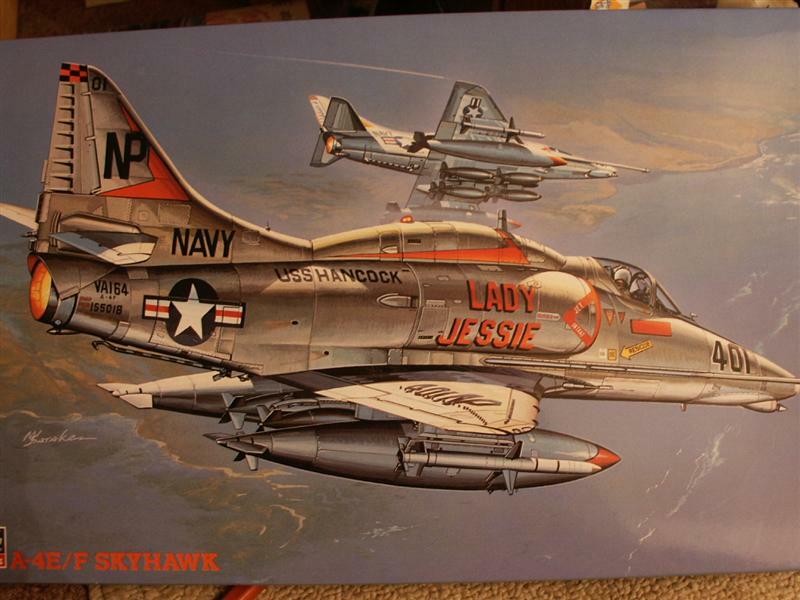 A-4G's woud have been similar to the one on the left, so I'm using that as my basis for painting. The kit cockpit mirrors this exactly. Cool! 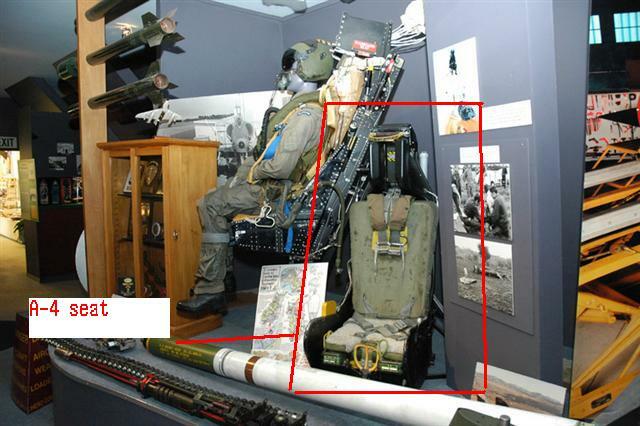 Took me awhile to find a pic of the seat, but the Kiwis bailed me out again with a shot of one in a museum. Can't think of the name of the place or how to pronounce it, but the building has a cool full size profile painting of an A-4 on the side of the building with their AF insignia. Test fit on the cockpit and pilot. 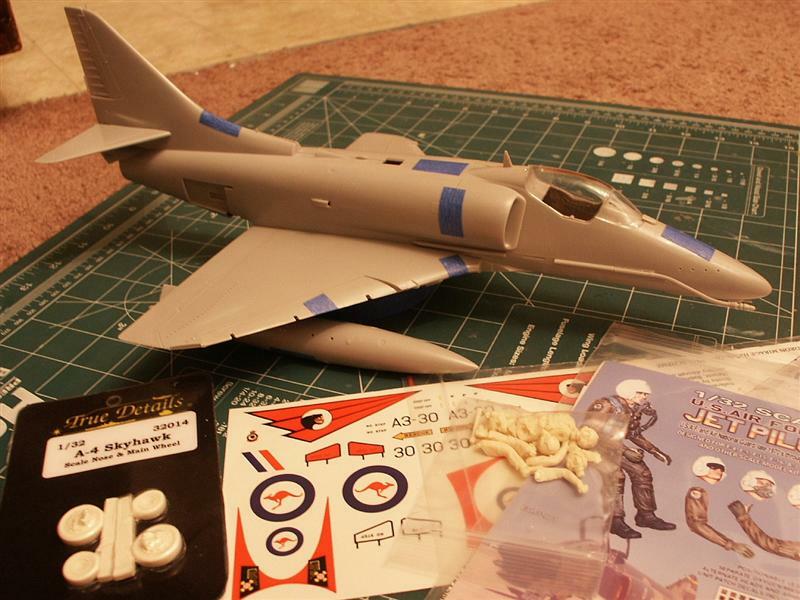 Wanted to make sure everything fit under the canopy, and the nose wheel-well lined up OK. Can't see too much of the pit when everythings together, but I'll make the effort and paint it all up nice and sweet. Really nice kit considering its age. Oh yeah Dave, I will be doing some re-scribing of access panels. The real AC is pretty smooth and won't have much in the way of panel lines. Even with the raised lines and rivets on this model, its really not too bad or over-done in my opinion. Hard to see anything in this close-up. The pilot is going to be a hybrid of resin and original parts. I WILL be replacing the head for sure. 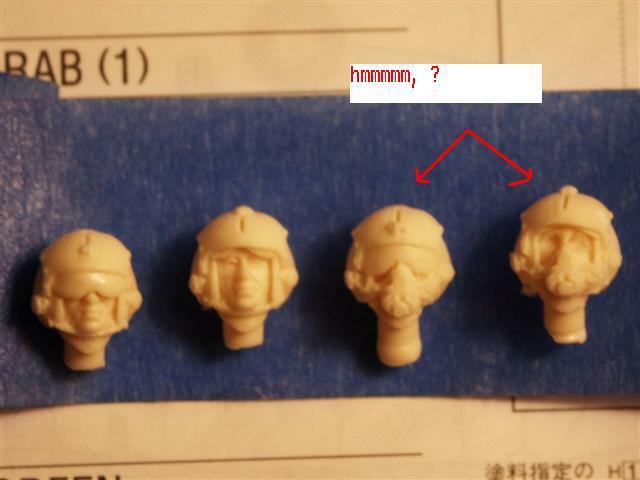 Master Detail pilots come with a choice of 4, and I'm trying to decide between these 2. Gonna have a white/red checkerboard pattern on the helmet visor. (trying to decide on a red ascot or not. ) He'll have shoulder patch decals, and other assorted tid-bits too. Hey Russ, I vote for that guy on the right. He looks scared. Give him bug eyes . 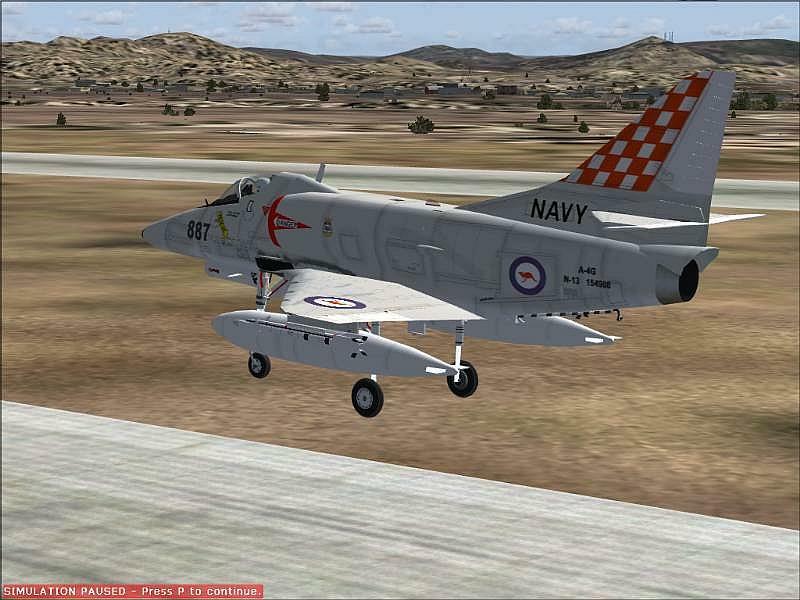 Is that one of RAZBAM's Skyhawks or Ito's? 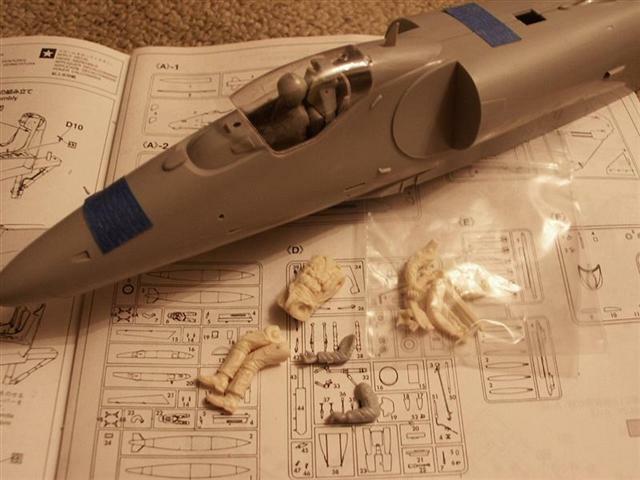 Whookay, Didn't get my cockpit painted tonight, cause I was busy playing Dr. Frankenstein with my pilot and chopping off the RWAR stuff on the fuselage. BLAST! Did however get a lot done on my future decal sheet, and have narrowed down my AC markings to #'s 870 or 871. The kit serial #'s are even in the same range as the A-4G's so thats one more thing I didn't have to look up a font for. whoohoo! Fell in love with this pic , which decided the AC I want to model. 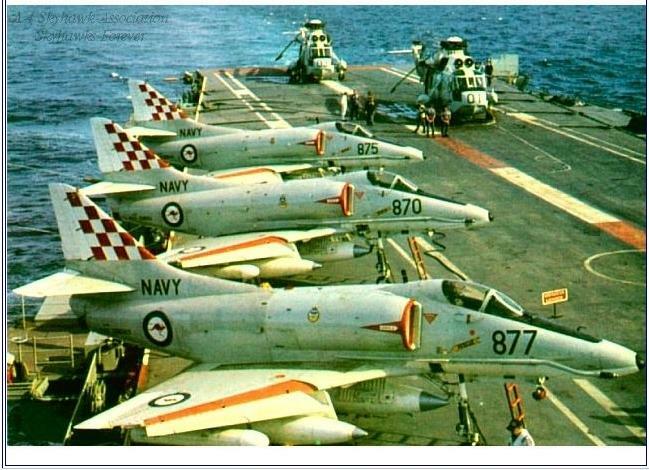 Here's another shot of it on the deck of the HMAS Melbourne. (middle AC) Yeah, that's the ticket!